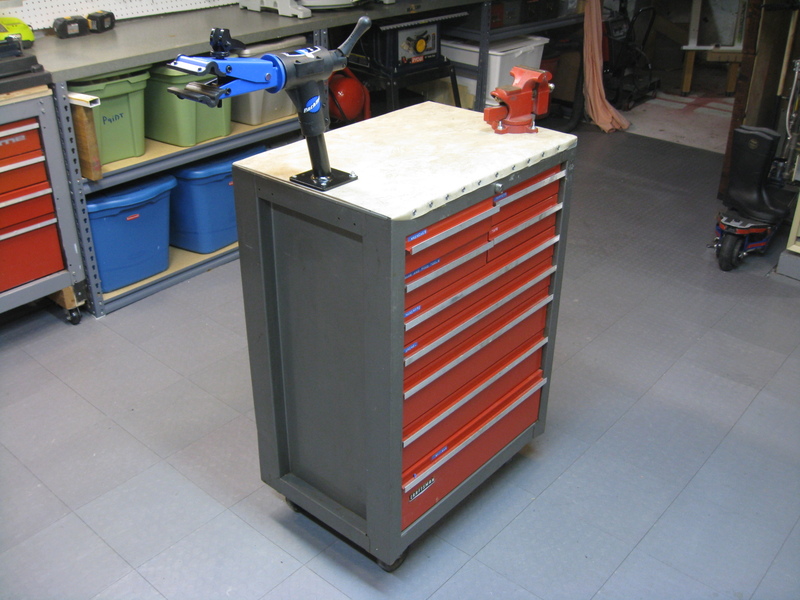 This is mostly a Park Tool PCS-9 Workstand. I bought it at a rather memorable tag sale. I liked moving it around so much I have it resting on three Shepherd 6" Tri-Dollies I bought at Home Depot. You of course recognize the X-Files lunchbox on the floor (now empty!) which contained the loose parts for the mountain bike project. 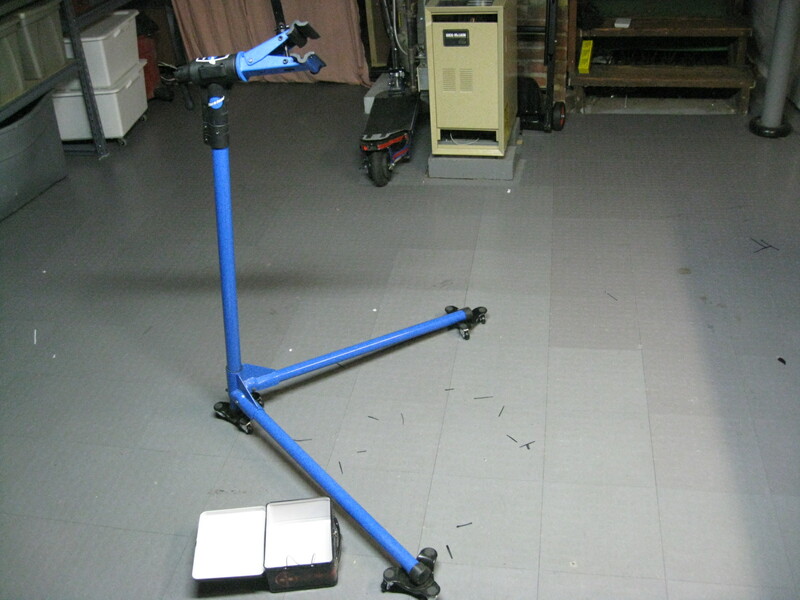 As much as I like Park Tool products, the PCS-9 stand is not one of them. It was a good $40 tag sale purchase but it is something I never would have bought new. I kept tripping over the legs and would injure my hands or injure my feet (or both) setting it up and taking it down, making me believe the stand was designed by someone who didn't like fingers or toes. If the bike wasn't balanced, it would tip, and there was the little matter of the clamp breaking off once when I tightened it, which made it useless. I had grown to like the workstand concept and shopped for reasonably priced solutions, finally finding one in Park Tool's excellent PCS-12 Home Mechanic Bench Mount Repair Stand. Not having a bench I was willing to mount it to, I sawed off the broken head of the PCS-9 and, as you can see in the photo, dropped the PCS-12 into its place. Only eagle-eyed visitors to this blog can tell the difference. 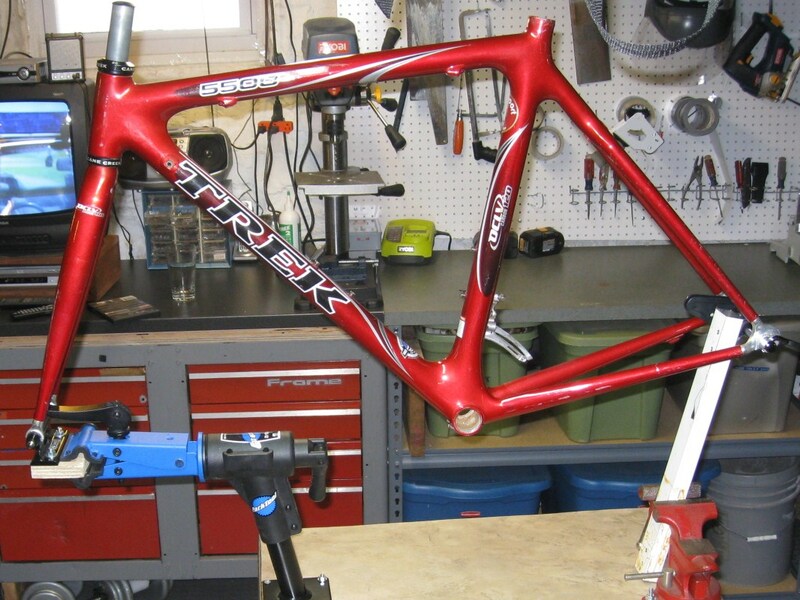 But I still valued my toes, and the mountain bike project had taught me a lot about my relationship with my shop. I frequently move from one place to another. My bike tools are scattered in different locations, and some of the parts are found in some of the 304 drawers on my workbench, others are just...elsewhere. I remember a qoute from Jamie Hyneman of Mythbusters in a Popular Mechanics interview about his workshop. If it wasn't a pull qoute, it may as well have been, because something he said about tools really hit home for me: "If you can't find it, you can't use it." The PCS-9 was built for mobility, but I wasn't really mobile. I moved around the shop but maybe needed the stand somewhere else once or twice a year at best. I also wanted all my tools to be in one place. I also wanted shop portability. Versatility. Durability. All of my toes. I knew I wanted all of those things. So why on earth did I build this? No, it is not a table from a Dexter Morgan kill room. 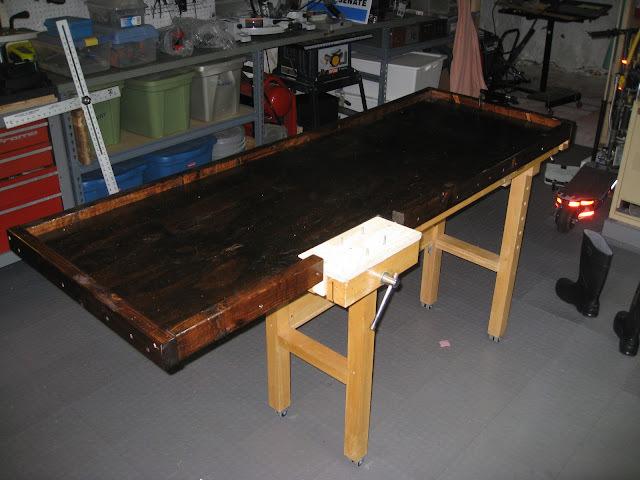 It is a overlay for my ACE hardware workbench with Minwax stain and five coats of polyurethane; one of the most difficult protective coatings to spell. As you'll note I have a Saris Fork Mount Carrier at one end. I mounted the PCS-12 workbench mount to the block of wood in the clamp in the foreground (yes, this thing is so big it actually has foreground). Nearly seven feet long and close to thirty inches wide on weak wheels from some piece of IKEA furniture. If I drank, I would have assumed I had been drinking when I designed it. I was able to recreate some of the logic that led to this monstrosity. I thought I wanted a big space but realized I liked a big shop more. I also thought I would dismantle bikes often and have a use for a large work area for tools I was using and overall messiness. But it didn't solve the storage problem and it was so big it took an entire commercial break just to walk around it. The shop looked more crowded and cluttered than ever, and when I did use the PCS-12 mount, it didn't provide a very stable workspace and gave me even fewer places I could roll it when it wasn't in use. 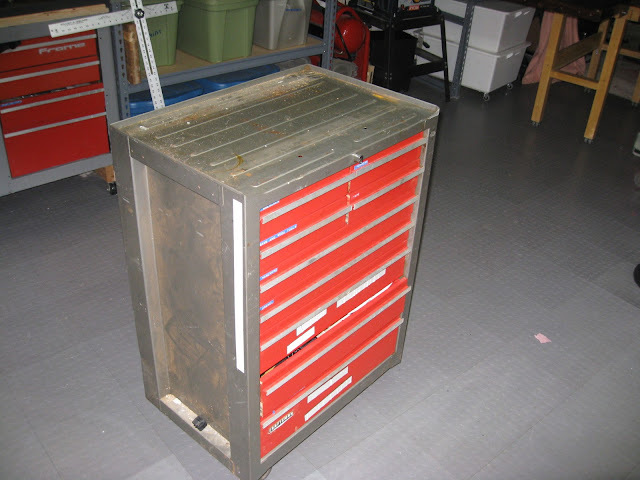 This is a Craftsman tool cabinet, a 30+ year old relic my dad gave me when I first moved in to my Stamford home. I remember it in his shop when I was growing up, and the drawers still glide as smoothly as ever. I hope Craftsman makes them like the used to, because this thing is tough. At the time I rolled it out to take this photo, it was being used to hold a cluttered jumble of tools that had little reason for fraternizing. Some of the drawers I literally hadn't taken anything out of (not 'opened' since I opened them all the time to look for things) in years. So I found some plastic tubs and put all the related tools into proper tubs and stuck them on a shelf. If I need to do some plumbing work, I'll pick up the plumbing tub. If I need to work with wood, those tools have their own tub. I was pretty confident the PCS-12 mount would work on this, so I cut a piece of plywood to fit snugly on the top. Not interested in staining the wood like I did with the monstrosity workbench topper (now standing up on one side in the shop) I found a piece of vinyl flooring and cut it to shape, using screws to fasten down the edge. Then, I positioned the mount for the PCS-12 and drilled four holes through the plywood and through the top of the Craftsman cabinet. The hardest part was to hold the nuts in place in the drawer while tightening the bolt at the top, and I get easily annoyed when I can't see the holes of what I'm trying to drive a screw or a bolt into. But I got it done sooner than I thought. Wanting the cabinet to stay stable with a heavy bike on the PCS-12, I filled the bottom drawer with lots of unused bike parts to use as ballast. Drawers were pulled out of the 304 and emptied into dedicated spaces for specific parts, tools and accessories. Then, it hit me. I ran upstairs and headed to my desk. On the hutch sat a row of books. The bookend was a red Craftsman vice I bought at (you guessed it) a tag sale years earlier. I pulled it off the desk and let the books flop down in disarray. While carrying the vice back to the shop, I peeled off the little no-slip feet I had placed on the vice so it wouldn't scratch my desk while it was on bookend duty. This was one of those Mythbusters Lead Balloon moments. Truly it was. And the bookend/red vice was now going to hold anything and everything I needed, including...wait for it...my Park Tool TS-2 truing stand. Yes, if I need to straighten a wheel, I just clamp it onto the bench, and when I don't need it, I put it...wait for it...away. 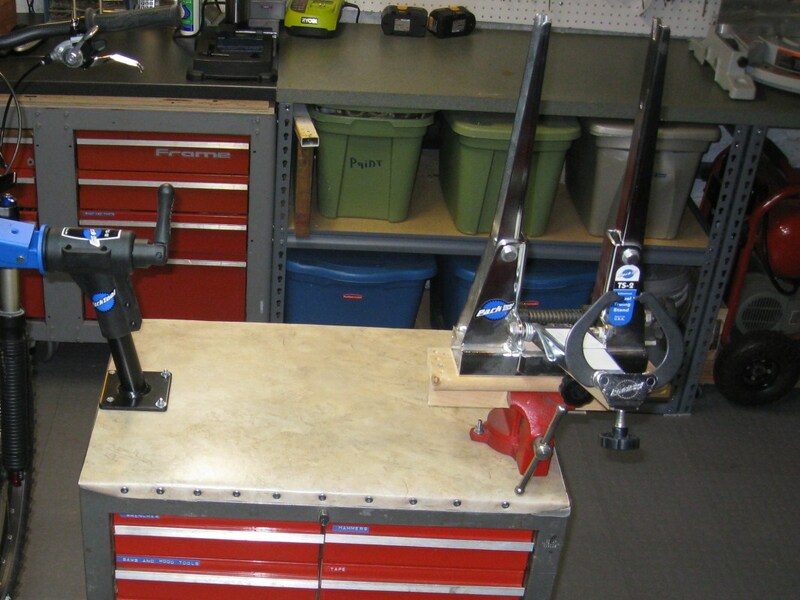 All of my bike tools are in one easy-to-use space, and the whole thing can roll into my welding room if I ever need it there. Yes, that is the Saris mount on a little piece of wood in the jaws of the PCS-12 while the rear is supported by a white painted piece of steel I took from an old trainer bolted to a Nashbar Chain Master (the frame, in case you're wondering, is much too small for me and normally hangs on on my wall for decoration). I can't think of a reason anyone, not even myself, would need to hold a bike frame like this. I just know that I can, and that's a pretty comforting thought for some reason. Is your ace hardware work bench hardwood or no?